Quickfire Review: The Drop (2014) – Hooray For Movies!! The Pop Culture Ramblings Of A Madman!! Synopsis: Bob Saginowski finds himself at the center of a robbery gone awry and entwined in an investigation that digs deep into the neighborhood’s past where friends, families, and foes all work together to make a living – no matter the cost. Previous adaptations of Dennis Lehane stories have generally translated well to screen, producing dark and complex narratives focused on how communities and individuals deal with life changing tragedies. 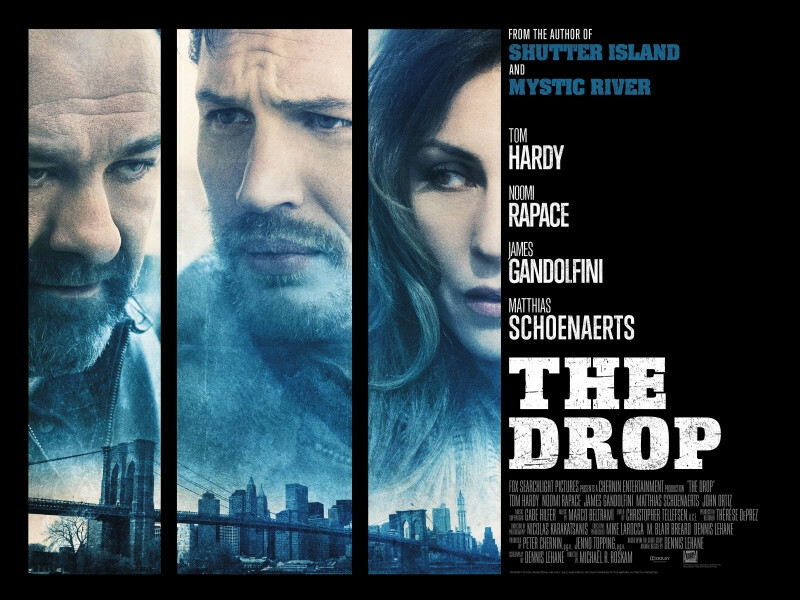 Compared to the most notable of those adaptations, Mystic River and Shutter Island, The Drop, adapted from a short story rather than a full novel, is the most accessible and also least accomplished. Bob Saginowski (Tom Hardy) is a doe eyed, quiet Brooklyn bartender who works at one of the neighbourhood’s “drop bars”, which make up a network of ever changing dead drops for mob money. When someone foolishly decides to rob the bar on night for a few thousand dollars, it places Bob and his boss Cousin Marv (James Gandolfini) at the centre of two investigation into who was responsible. The first an official NYPD investigation headed up by a tenacious Detective who is also determined to solve a long standing missing persons case in the neighbourhood. The second an unofficial and far more effective investigation by the Chechen mob whose money was stolen. Mob investigations tend to involve less paper work and more severing of limbs. Tangentially Bob also finds himself forced into adopting and caring for an abused pitbull puppy left to die in a bin at a nearby house. This new found responsibility draws him into the life of the woman whose bin he found it in (Noomi Rapace) as she shows him how to train and look after another living being. It also brings unwanted attention from her unstable ex-boyfriend and local nutjob Eric Deeds (Matthias Schoenaerts). As with Mystic River and Shutter Island, The Drop follows Lehane’s model of seemingly unconnected story arcs converging to reveal a much darker secret in the final act. Unlike in those movies however the final reveal is neither particularly shocking nor well concealed in it’s approach, and the relatively sparse narrative arcs feel like someone stretching a short story to fit a feature running time. It is however a well enough acted and solidly directed affair, particularly from Hardy, despite his mumbling Brooklyn accent, and with enough moments of genuine tension (generally heightened by the presence of a very cute puppy who is always left in a state of uncertain peril) to carry it through to it’s somwhat obvious conclusion. Good review. The cast is great here and absolutely helps to allow for this material to jump off the screen. Hit it here to join the Hooray4Movies rollercoaster! Hit here to follow us!